President Donald Trump and European Commissioner Jean-Claude Juncker gave a late-announced press conference in the White House Rose Garden Wednesday as they announced an agreement to work toward and operate in the spirit of a “zero tariffs, zero non-tariff barriers, zero subsidies on non-auto industrial goods” trade deal. Already today the United States and European Union have a $1 trillion bilateral trade relationship. The largest economic relationship anywhere in the world. We want to further strengthen this trade relationship to the benefit of all American and European citizens. This is why we agreed today, first of all, to work together toward zero tariffs, zero non-tariff barriers, and zero subsidies on non-auto industrial goods. Trump thanked Juncker for this agreement. Their fourth agreement was to “join forces to protect American and European companies from better and really better than ever…we will therefore work closely together with likeminded partners to reform the WTO and to address unfair trading practices including intellectual property theft, forced technology transfer, industrial subsidy, distortions created by state-owned enterprises, and overcapacity.” These practices ring of criticisms the U.S. and President Trump have lodged against the Chinese as unfair trading practices. 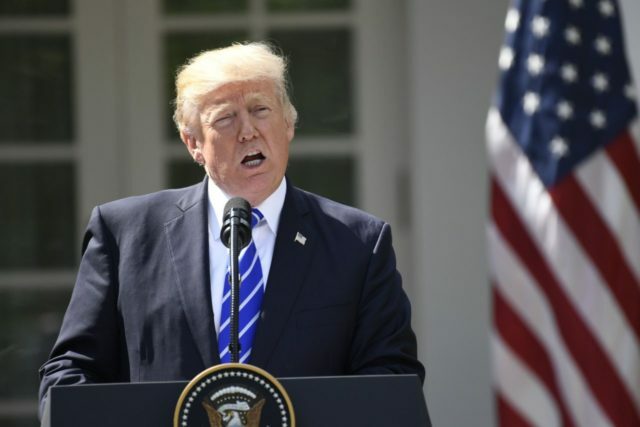 “We also will resolve the steel and aluminum tariff issues and we will resolve retaliatory tariffs,” said Trump. Juncker then spoke of the deal and said they identified a number of areas where the U.S. and E.U. can work together. He said that he came to the White House Wednesday with the intension of working out a trade agreement. He said his primary focus was on working toward “zero tariffs on industrial goods.” He echoed President Trump and efforts to strengthen energy cooperation and importation of LNG. He also spoke of the soybean import increase and working toward reforms of the WTO. The two will hold off on further tariffs and the U.S. will relent on steel and aluminum tariffs. “This was a very big day for free and fair trade, very big day indeed,” said Trump in closing. The announcement came after Trump and Juncker spent the early afternoon meeting on issues of trade between the U.S. and E.U. Trump called out the names of several Senators present at the joint press conference.